Honourable Joshua Osih has been elected as the candidate of the Social Democratic Front for the upcoming Presidential Election. He was elected on Saturday in an extraordinary convention to designate the party’s candidate for the upcoming Presidential election. He won 88.3 percent of the votes as against 11.61 percent for his mainly challenger Nchinda Forbin Simon. The third challenger Hon. Joseph Mbah Ndam pulled out of the race at the last minute but did not pledge his support openly to any of the two remaining candidates. In his acceptance speech, Hon. Osih Joshua promised as from tomorrow to start visiting all the 360 sub-divisions of the country to rally support. The day started with the SDF presenting the new members of the National Executive Committee who were elected on Friday night. 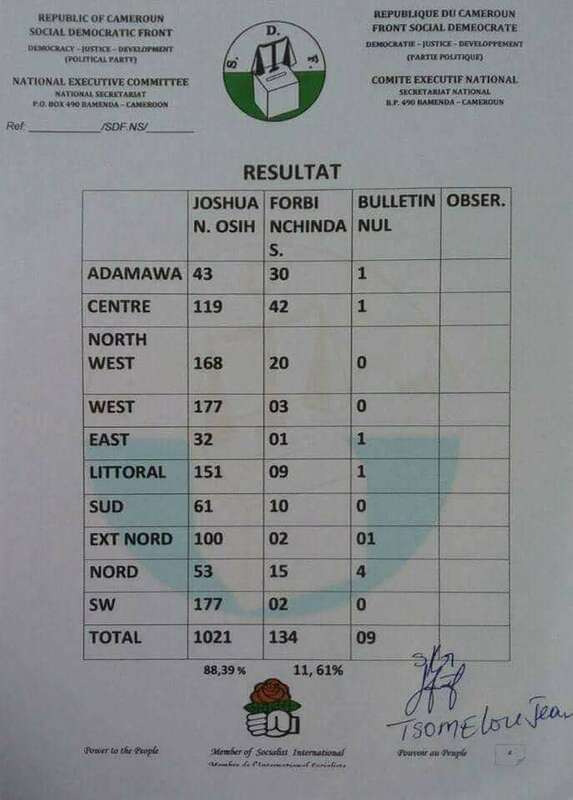 Notably, Ni John Fru Ndi who pulled out of the Presidential race was maintained as Chairman of the party while Joshua Osih was equally re-elected as the party’s Vice President.